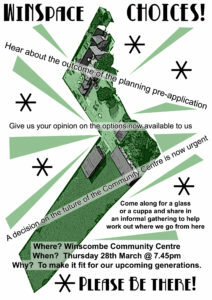 Winscombe New Space – WiNSPACE – is the working title for a Winscombe Community Association (WCA) project to look into how we might update the community facilities for 21st century Winscombe and make that happen. After 40 successful years with our current buildings the time has come when we have to think about how we can preserve that legacy and take it forward by upgrading our facilities. What the village needs has changed over that time and will go on changing. We now have a really exciting opportunity to find out what people want and create something special for the next 40 years!! There will be an informal public meeting on Thursday 28th March 2019 at 7:45pm in the Community Centre to hear more and help us decide which way to go. Having spent some time over the last few years exploring our needs, parish opinion, possible options and partners we are at a crossroads. We need to make a choice about how to proceed.